Copyright Internet Book Review 2014. Powered by Blogger. I read a lot Science Fiction and Fantasy books and they can be pretty long, complex and take some time to read. You know what I mean, lots of big long exotic names, countries, empires, planets, factions... so many that it can often take some time just to work out who's doing what to whom and get into the groove of reading them. Which is why I will always need straight out action/thriller books to kind of cleanse my mental palate. You start, within a chapter you're off and racing and you don't stop until the end, don't worry about anything else along the way! 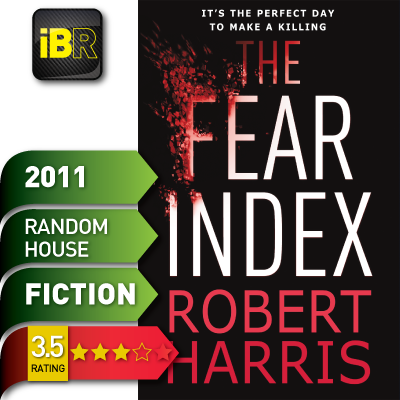 Robert Harris is one of those authors who pretty much hit the spot most times, so when I was handed a copy of The Fear Index, I stacked it under the biggest unread book I have on my side table ready to let my mind blow off steam after another big Fantasy tome. Fear Factor is set in modern day Switzerland in the secretive world of private hedge fund managers. We focus on Dr Alex Hoffman, an ex-pat American physicist, former CERN scientist and all round numbers genius who has founded his own private hedge fund using his revolutionary machine learning algorithm. He's done so well he's worth a lazy billion or more, lives in a luxury mansion on the shores of Lake Geneva with his wife, an English artist. However, he's also somewhat of a recluse, allowing his business partner to be the public face of the business and bring in the ever increasing list of super high net worth investors. Simply put; Alex Hoffman knows how to make money and lots of it, no matter what the market does... or more rightly he knows how to write programs that make money. However, this easy success is shattered by a late night break-in at his very, very secure house, some very odd and disturbing margin calls made by his latest supercomputer seemingly before the events the margins calls were speculating on occurred. Alex has to figure out if there's a mole in his company, if his business partner is trying to get him out of the business by killing him, just who is stalking him and who or what is controlling his newest computer creation, all whilst some old mental health issues come back to haunt him. If I was looking for a super fast page turner that you simply have to keep reading, this book delivers exactly that. In fact the book plays out from start to finish in around 24 hours, so there is no time to stop and pause. Which is both good and bad, the pace makes you keep reading and Robert Harris is certainly on form with his writing, the tension is built effortlessly, the action is riveting and the story poses some very interesting questions. However at just 323 pages, with generous margins all round, there's no denying there is not a lot of book here... and it shows, as we really only see two or three characters fully fleshed out, the rest are just the standard players there to drive the plot forward then discarded when their job is done. We don't get to explore too much as we're too busy dashing to the next scene. That's the rub with this kind of book, I really crave fast action after getting through longer more fully realised works, but once it's read the appetite is rarely sated for long. Recommendation: A good example of the genre with some interesting ideas in a world not many would know about, with cracking fast pace. Certainly worth the time to read it.